- Publisher A balanced blend of doctrinal, historical, archaeological and geographical detail on the life of Jesus written in a fresh style. Culver uses his skills honed as a professor of both Biblical and Systematic Theologies to present an allrounded book that should be an invaluable handbook on the life of Christ. About "Earthly Career of Jesus, the Christ, the"
A balanced blend of doctrinal, historical, archaeological and geographical detail on the life of Jesus written in a fresh style. 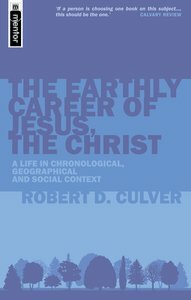 Culver uses his skills honed as a professor of both Biblical and Systematic Theologies to present an allrounded book that should be an invaluable handbook on the life of Christ.